-Hunter Jackson rents a studio in an old Richmond Dairy building, intending to shoot a space pirate movie entitled "Scumdogs of the Universe". He names his studio "The Slave Pit"
-The set for the "Scumdogs of the Universe" movie begins. -Two costumes are completed and Death Piggy moves to the Dairy building. -Mike Delaney moves into the Dairy building and names his studio "The Swamp". -Death Piggy borrows Hunter's costumes and plays two shows as "GWAARGGGH!!!" -Chuck Varga moves to Richmond and moves in with Delaney. 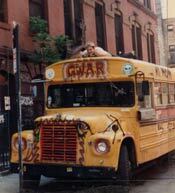 -GWAR begins playing Richmond regularly. -Don Drakulich rents studio space in the Dairy building and ultimately moves in. -Many new artists and bands move into the Dairy building. 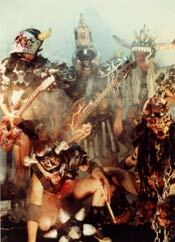 -The GWAR band line-up solidifies somewhat. -Slave Pit, The Swamp, and Don's studio begin prop production for GWAR performances. -Halloween of that year GWAR performs at Virginia Commonwealth Univeristy's (VCU) Shafer Court. -Renovations to the Dairy building force many tenants out. -Prop production moves to a tobacco warehouse a few miles away. -Hunter returns from Detroit briefly for movie filming. -Musicians Chris Bopst, Greg Ottenger, and Jim Thompson all quit. -Slave Pit is soon kicked out of the tobacco warehouse and returns to Don's cramped Dairy space. 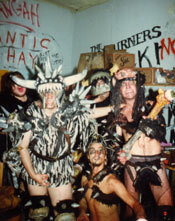 -The artists solidify from loose a collaboration to real members of GWAR; consisting of Don Drakulich, Chuck Varga, Mike Bonner, Scott Krahl, Dave Musel, and Dave Brockie. -New band members are recruited; Dewey Rowell, Steve Douglas, Mike Bishop and Rob Mosby. -The first schoolbus is purchased and local touring begins. -In August, "Hell-O" is recorded in New York. -Band practice space and fabrication shop move in. -Hunter moves back to Richmond. -In February, "Hell-O" is released. -Constant touring begins in support of the release. -Steve Douglas leaves and Mike Derks joins. -Lisa Harrelson leaves and Danyell Stampe joins. -Danny Black recruited as Slave/Roadie. -The North American tour aptly named Death Tour 89, begins. -Rob Mosby leaves and Pete Luchter joins. -Pete leaves and Jim Thompson temporarily rejoins.